For all we know, automobile airbags are among the most effective protective measures which help decrease the effects of a collision on the passengers. As a matter of fact, it has been reported that deaths were decreased by up to a whopping 52 percent in the case of both belted drivers with frontal airbags as well as SUVs equipped with side airbags. In each automobile, facilitated with airbags, there is a sensor with the capability to detect a collision. In the event of a collision, the detector sends an electric signal to the airbag storage. The signal reaches an igniter compound that gets warmed up to result in the decomposition of sodium azide within the compartment. In addition, the heat contributes to the filling up of the airbag with nitrogen. All of this happens in an incredibly compact duration of 0.03 seconds, and over 0.05 minutes of the collision, the inflated airbag forms a buffer between the occupants of the vehicle and the steering column/dashboard. • Airbags prove to be extremely effective in protecting the passengers from any significant head, neck or spine injury by providing these parts with adequate cushioning. • Airbags limit the distance that the head of the passenger hurls forward, thereby lowering the chance of injury to the head. • The deployment of airbags is proven to reach incredibly high speeds of around 200 mph, and can, therefore, result in acute fractures or internal injuries as a result. This is particularly the case when the driver’s body is too near the steering column. 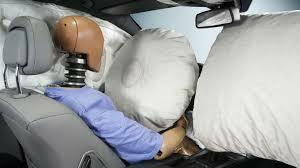 • for those airbags to be really effective, it is very important that vehicles have both, front and side airbags. • You must always invest in a car that offers both, front and side airbags. • you must always use your seat belt, as airbags end up being more effective when deployed on a belted passenger. • In case your car’s airbags have been deployed as a result of collision, you must ensure that you have them re-installed only in an authorized auto car care center. Do make sure that you put this knowledge to good use. Until next time, keep safe!